In Finland, dozens of music events with strong connections to nature are organised each summer. Nature itself seems to form an integral part of a successful festival experience at these events. We discussed with music researchers Merja Hottinen and Juha Torvinen the relationships between nature, the environment, music and listening experiences. The alternative and underground H2Ö Festival, organised in Turku for the third consecutive year this summer, made the old Ruissalo docklands bloom with a rough and warm industrial look: organic surfaces, shapes and materials met the hard and metallic infrastructure that oozes with the shipyard’s history, both through music and the general look and feel of the festival area. The edgy lighting design brought life to the weathered industrial cranes in the darkening late July nights, with the sea undulating in the background. 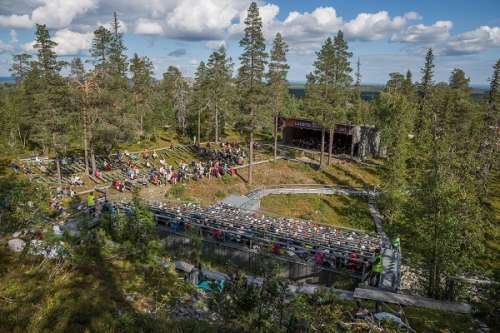 Finnish classical and contemporary art music events have often chosen natural environments over urban spaces as event venues. What comes to mind when you think of such events as the Kuhmo Chamber Music, Luosto Classic or Naantali Music festivals? Forests, mountains, the sea and the archipelago are strong contributors to the mental image we have of these events. There has been a long drive to extend classical and contemporary art music event venues beyond natural environments and to include other places where such music has usually not been heard. Concerts at the Viitasaari Time of Music or Kuhmo Chamber Music festivals, for example, have been organised not only in nature, but also on the front stairs of houses, in libraries and courtyards where audiences have to make do with the number of chairs that happen to be available, and where many other elements of traditional concert etiquette have been absent as well. In their promotional and marketing copy, classical and contemporary art music festivals most often describe the relationship between nature and music as a particularly positive factor which strengthens the overall musical experience. The distance from growth centres and their busy lifestyle is emphasised. Merja Hottinen is currently working on her doctoral research on the cultural meanings of contemporary music events in Finland, and one of her case studies is the Time of Music Festival which has been organised since the early 1980s. The undeniable significance of nature as part of the festival is clear in the articles written about the event as well as in the verbal recollections of festival organisers, performers and audiences. “International guest composers are infatuated with the scenery and the light, a journalist reminisces about picking wild mushrooms in the forest with John Cage, and the municipality of Viitasaari uses nature as a drawcard for tourists, advertising local fishing and kayaking opportunities in the festival brochure,” Hottinen says as she describes some of her research material. 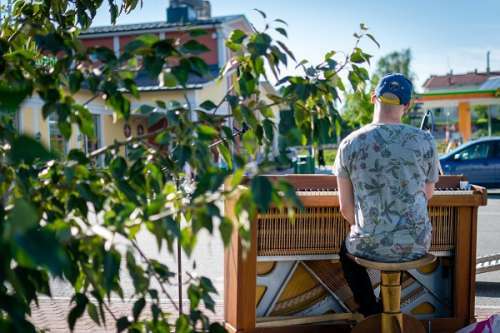 Pianist-composer Kalle Vainio gave pop-up concerts at various locations around Viitasaari in 2016. However, mental images of the wonders of nature can sometimes be in stark contrast with the real-life circumstances, where it is often rainy or windy and people get cold or bitten by mosquitoes, although these experiences hardly ever get a mention. Hottinen sees the Time of Music Festival as an interesting example of how the theme of nature can comfortably be associated with other kinds of mental images as well. “The juxtaposition is formed through the extremely urban and modernistic image of contemporary music, and this is a big part of the rhetoric surrounding the festival. In participant feedback, however, the relationship to nature never comes across as problematic or conflicting, with everyone agreeing on the special significance of nature for the event,” Hottinen explains. As a researcher, Juha Torvinen has explored ecomusicology, and especially the music cultures of the North. In Finland, the relatively new discipline of ecomusicology draws from ecocritical literature, reflecting on the relationships between music and different environments. Torvinen feels that the act of listening is always loaded with particular meanings, and thus the listening environment plays a big role. “Playing and listening to music in the midst of nature has a sneaky power to influence one’s environmental awareness as well, and festivals organised in certain environments offer a certain listening perspective,” he says. A Luosto Classic concert venue on Ukko-Luosto fell. Photo LuostoClassic Artctic Film Crew. It is also significant if the new contemporary music work receiving its premiere has been composed with a particular natural environment in mind, and is performed there. Torvinen cites Kalevi Aho’s Symphony No. 12 “Luosto” (2002–2003) as an example of a work which is an environmental art work in itself. “It is designed to be performed on each of the four sides of a mountain – and of course the work sounds very different and unique there, compared to a performance in a concert hall. The mountain’s acoustics form an independent element of the work,” Torvinen states. Local audiences and festival guests experience musical events from distinctly different viewpoints. While the mountains or rapids in Kainuu or Lapland are a part of everyday life for the locals, seeing and experiencing a symphony orchestra may be a completely new and exciting event for them. For festival guests and musicians, the local nature is an experience in itself, and international visitors can see Finland and Finnish nature as something alien and different, even exotic. “Festival organisers’ tendency to stage events in the midst of nature has a certain element of mystification or escapism. While the actual concerts are enjoyed in a natural environment, guests can be accommodated in four-star hotels. There is nothing wrong with that per se, but it may be that an experience of nature is not the essential element in that package,” Torvinen muses. He sees a lot of positives in bringing art to the people. There is no need always to rely on “sacred” places, such as churches or concert halls, to be able to experience art. “It is important to dust off the traditions of the canon. This gradually helps music to gain a wider range of associations, beyond the old conformities,” Torvinen continues. With ample amounts of music offerings and events to choose from, the competition for audiences is stiff. Festivals have to come up with distinct profiles and find their unique directions. One of the reasons behind the strong presence of nature in festival profiling is the fact that it is otherwise hard to market the small towns they are organised in. The Finnish summer is short, and the proximity and presence of nature is a part of a brand that benefits the whole local community. “Unless you are in London or another great metropolis, you really have to work those features and attractions that are readily available. Even if it means sitting in a concert in the pouring rain, that very concert may well stick in listeners’ minds as a particularly memorable event – for Finnish and international audiences alike,” Hottinen says. Main photo: Salla Hakkola’s Harp Rally at the Viitasaari Time of Music Festival in 2013. Photo: Ville Mattila. See also Music Finland's guide for Finnish summer festivals 2018 here.